Import Excel (XLSX, XLS & CSV) file Contacts to VCF file. When you load your Excel file to convert XLS to VCF file, get complete preview of saved contacts in Excel file. You will be able to see table of contacts in rows & columns of the Excel sheet with the contacts and other data in it. XLSX to VCF converter is capable to convert contacts from both .xls and .xlsx as well as CSV databases. So that you can employ Excel to VCF conversion for files belonging to entire versions of MS Excel including; Microsoft Excel 2000, 2003, 2007, 2010, & 2013. Convert multiple contacts from Excel spreadsheet into VCF. 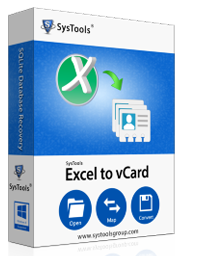 This Excel to vCard converter tool is being tested on almost 40,000+ contacts & found to be suitable tool for converting limitless contacts from XLS, XLSX or CSV file into vCard. This Excel to VCF conversion software allows conversion of contacts from Excel sheet into 3 distinct vCard versions i.e. vCard 2.1, vCard 3.0 and vCard 4.0. Users can select any edition of vCard depending on their requirements. By default XLS to vCard conversion software creates separate vCard file for each contact. So, you can create individual VCF file for each contact address saved in your Excel sheet. Creating a separate VCF file is always convenient. Excel to VCF export tool automatically exports all contacts of Excel file into separate VCF files but in case you want to create single vCard file for all contacts, then you can avail the option of "Single vCard File for All Contacts". This Excel to vCard converter tool allows an option to export contact with empty address field. To export such contacts into VCF file, you need to enable "Allow empty email address to be imported" option in the xls to VCF tool. While converting excel file to VCF Format to sync the data fields properly a mapping option is available. You can choose the data entry from the columns provided and map it with the options available in other column from drop down menu to map the columns as per your need. An MS Excel File used as the common file format to store contacts information in a Tabular form. This file can store a different kind of numeric and alphabetic entries without any issue. But Excel file cannot use to share information since doesn't act standard contact format and to convert the Excel contacts into Vcard or VCF format is the first option. A VCF or vCard File format used as a standard Business card to store user information on the different platform such as Email client, Windows, iPhone, Android Device and also used in messenger application to store addresses. Trial edition of XLSX to vCard Converter converts all contacts from Excel into vCard but keeps details of emails & contact no.s partially encrypted. With Demo version of Excel to vCard conversion software, convert all Excel file contacts into VCF file but stores contact of Email Address as '***Demo ***@Demo.com'. Incase of phone number only first 8 characters or no.s will be saved. How can I convert Excel File to vCard or VCF contacts? MAP Excel attributes with Excel attributes. Will Excel to VCF converter able to convert multiple sheets of contacts? Yes, the software loads and converts contacts from the entire Excel file regardless of the number of sheets maintained within. Is it possible to work with Excel to vCard Converter tool on a Windows 8 machine? Yes, You can create vcard from excel file in different platform such as Windows 10, 8 as well as all below versions of the Operating System. To import vCard to outlook, Do I need to have Outlook on my machine? No, Excel contacts to vCard converter is a standalone and doesn't require support of an external application. You can import contacts to outlook 2013 from excel without need of Outlook installation. Is it possible to also preview the contents of my Excel file? Yes, the software instantly loads and displays a preview of all contacts within the selected Excel file. After converting XLS file into vCard format, Will the output compatible with my smartphone? Yes, you can import the vCard file on an as well as on a number of email clients. Does the software export contacts from excel to vCard format supported by Outlook? The Excel to vCard software offers the option to 'create a single vCard for all contacts' or 'an individual vCard for each contact', to let you choose from. Also, note that, you can choose from any of the given vCard Version, i.e. 2.1, 3.0, and 4.0 to convert the contacts. Is there any demo version limitation while converting Excel contacts to vCard format via MS Excel to vCard Converter? The Free Excel to VCF converter version allows the user to Display & Export " First 5 Character of Email address " & for the Phone number, it displays & Export "First 8 Character of the Phone Number". Finally able to convert Excel file to vCard file format. As both are different file format but still Excel to VCF Converter perfectly exports & converts each Excel contacts into single vCard format. Now I can import contacts from Excel file to my iphone & andriod phone. Download the XLSX to vCard converter freeware version to test whether the tool able to convert my contacts stored in XLSX file to Vcard file or not. Surprised by different Options available to convert Excel file into vCard format Version such as 2.1, 3.0 & 4.0 .